So, what do parents need to know about Friedrichs Plenty. This morning, the U.S. Supreme Court heard a case brought by Mrs. Rebecca Friedrichs and nine other California teachers who are not members of the teacher’s union, but are required to pay agency fees to the union, say that they do not benefit from the collective bargaining agreement and that collective bargaining is political because it includes workplace rules and requirements that prevent laws from being passed that would improve under-performing and under-served schools. For me, the suit brought by Friedrichs and her nine other colleagues brings awareness of the consequences of forced compulsory dues laws. While compulsory laws may have had good intentions decades ago, laws that force parents and teachers to do what is against their interests and those of children are wrong. It is unconstitutional, unethical, and wrong to force parents to send their kids to unsafe and low performing schools. It is unconstitutional, unethical, and wrong to force teachers to pay for other people’s political campaigns and agendas. Neither parents nor teachers should be forced to do what is morally wrong. Sunday is usually a day of worship for black people and other communities. We pray for peace, guidance and strength to get through a long work week. We may even watch football and basketball with our family and friends. But for black parents such as myself, along with New York City Parents Union President Mona Davids and @ThinkingintheGray, this weekend served as another reminder of Martin Luther King Jr.’s aphorism that we must remember the silence of our friends and not the words of our enemies. For me, it began with a Twitter exchange between @ThinkingintheGray and Dropout Nation Editor RiShawn Biddle about the move by Success Academy founder Eva Moskowitz last month to release the school discipline records of a 10-year-old boy in violation of the Family Educational Rights and Privacy Act. Why did Moskowitz do this? Because she and her charter school operation were engaged in crisis management. As this publication reported, the mother of the child, Faidi Geidi, appeared in journalist John Merrow’s PBS NewsHour report on Success Academy’s high suspension rates. What Biddle and @ThinkingintheGray were pointing out was the fact that many school reformers stood by uncritically, both as Success released the child’s discipline record in violation of federal law and morality, and as Moskowitz’s schools suspended high levels of its students. Some, in fact, outright defended Success Academy’s practices. When it comes to black children, many reformers and traditionalists seem to be on the same side. The wrong one. I couldn’t just sit by and read. I jumped neck deep into Twitter conversations with my so-called school reform “allies”, demanding how they could justify Success Academy’s violation of a child’s privacy and right to not be brutalized in the name of public relations. I found myself reminding fellow reformers that the first duty of the movement is to children, not to adults regardless of their stances on transforming public education. I had to ask one fellow reformer how he could support Success Academy after they released this child’s record to the public. I even found myself defending both the right of families to choose any school they want and the right of advocates for children regardless of partisan lines to criticize the overuse of suspensions by Success and other operators, traditional, charter, or private. Unlike Dropout Nation‘s editor, I’m not going to embarrass these reformers by naming their names. What I will say is that Mona, @ThinkingintheGray and I have found that we were on our own. What we heard from our fellow “reformers” and “advocates” for equity were justifications for throwing a child under the bus, all because they fear that traditionalists (including the National Education Association and American Federation of Teachers) will succeed in their efforts to halt the expansion of school choice. They were unwilling to think that you can both celebrate the expansion of school choice that benefits all families and also call it out for practices done by charter schools and traditional districts that are harmful to the futures of children. There were others who clearly believe that black children aren’t worthy of nurturing, think they are little more than “disruptive” presences in schools, and deserve to be kept out of them. Despite calling themselves school reformers, they have long ago demonstrated that they will defend practices that harm black children. We didn’t expect to ever sway them. But certainly other reformers will jump in on our side. Or so we thought. But outside of your esteemed editor and a couple of other folks (including Alex Medler of the National Association of Charter School Authorizers), all we heard was crickets. And that hurt me more than the exchanges themselves. I’ve always known that traditionalists, especially NEA and AFT leaders, have low regard for parents and children, especially those black and brown. Dropout Nation revealed this to all of us four years ago when it shared a presentation by AFT’s Connecticut local on how it tried to stop the successful effort by a predecessor of the Connecticut Parents Union to pass a Parent Trigger law. 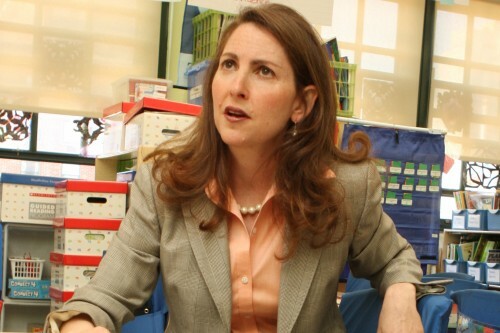 Many reformers chose to side with Success Academy Founder Eva Moskowitz over poor and minority children. To call this unfortunate is being kind. What I have learned this past weekend is that there are school reformers who have as low a regard for black children and others from poor and minority households as the traditionalists we fight every day. What I also learned is that as a black parent, my voice and thoughts are given less regard than teachers by a good number of those who stand for reform. In some minds, the righteous indignation of a black mother is regarded as irrational anger when what I say is inconvenient for advancing their goals. As Teach For America staffer and Black Lives Matter activist Brittany Packnett once wrote on Twitter, we will always be “the angry black woman” when we “stand up for what’s right”. What I also realized is that Mona was right when she said that teachers’ unions and reformers are battling over school funding and “the chattel is our black children and poor communities.” This doesn’t mean that every position taken by NEA and AFT affiliates, along with other traditionalists, is wrong. It also doesn’t mean that all reformers are wrong in their positions. What it does mean is that we must always keep in mind that there are many on both sides who have low regard for our poor and minority children. And on that front, they will always eventually show their true colors. At the end of the weekend, I realized that I must reaffirm my role as a mother, a parent, and a fan of humanity. I must reaffirm my conviction that adults can never negotiate the education, safety and well-being of our children. All children matter. As black mothers and fathers, we must stand between both the traditionalists and the reformers who don’t mean our children well. Because our allies can sometimes be as bad, if not worse, than our opponents. Sun Tzu once wrote that attacking an enemy’s strategy is of “supreme importance” in any war. This is a lesson school reformers should be doing in their efforts to sustain their efforts – and it must include fully embracing parents as lead decision-makers in education. This is something I have strongly reflected upon over the past two weeks, especially after watching charter school operators such as Achievement First fail miserably in their efforts to provide parents with opportunities to choose the best educational opportunities for children. I also thought about this last week after listening to RiShawn Biddle on the Dropout Nation Podcast on how reformers must expand their social networks, as well as reading the Storify put together by Chris Stewart of Education Post that challenged the belief gap among traditionalists. What I have concluded is that reformers must do better. Because right now they are not doing nearly all that well right now. I know this from last month, when I attended a New Haven school district meeting that focused on discussing Achievement First’s school proposal. The plan, called Elm Street Imagine, would have provided much-needed academic opportunity for children and parents in Connecticut’s third-largest district, and at the same time, offered an opportunity for districts and charters to partner together effectively in providing great schools to our most-marginalized populations. But as you know from listening to last week’s Podcast, it didn’t happen that way. What I encountered instead was a school board meeting where the majority of attendees were New Haven’s mostly-white teachers, most of whom don’t even live in the city, who fought the Achievement First plan. What I saw was the New Haven local of the American Federation of Teachers, whose rank-and-file membership is 77-percent white, fighting against helping the district’s black and Latino children get the education they need for college of a trade. What I saw were people whose minds were plagued by the belief gap, the soft bigotry of low expectations, arguing against the needs of the people who live in this urban community. What happened was that the war between teachers’ unions and school reformers was rearing its ugly head – and would be the focus of the school board meeting instead of doing what was best for children and parents, most of whom are low-income and people of color. What I didn’t see was Achievement First working with families in such a way that they could stand up for its plan, so that the parents can take ownership and make the case to New Haven’s school board and superintendent. Achievement First’s Dacia Toll deserves praise for standing up to the AFT and to those teachers. But she needed parents and the community to take the lead for her and her plan. This was disappointing because charter schools and other innovations are part of the solution for addressing our country’s education crisis. If all was well within traditional school districts, parents wouldn’t be clamoring for charters. But selling innovation and choice isn’t enough. This is a lesson that school choice advocates and school reformers, in general, have not yet learned. Since I began my work, I have seen school reformers use “moments in time” strategies featuring kids and parents in matching t-shirts marching on statehouses during legislative sessions. But the yellow t-shirt brigades are no substitute for sustained advocacy, especially in galvanizing marginalized communities for the hard and daily work that we need for children. Most of the families I know sleep in the t-shirts after the rallies have ended, and enjoy the food and music they got at the events. But they go back to business as usual because they already know that the t-shirts don’t stand a chance against the teachers’ unions and other traditionalists who have the loudest voices. The parents know that teacher’ unions and administrators have statutory access to children and parents through classrooms, open houses, and the rest of the activities that make up public education. The parents know that reformers will more often than not lose because they continue to underestimate the access that NEA and AFT locals have to families day to day. The parents also know that administrators, teachers’ unions and many in their rank-and-file don’t care about building lasting relationships with parents and children. They know they don’t need to, either, because the unions and their members have majority access to our children and families. And they can win either through persuasion or intimidation against their children. This matters because the belief gap among many teachers affects the self-esteem and academic performance of our children of color. Parents are ready to fight for their children against these low expectations and they are willing to fight for school choice as well as Parent Trigger laws. But we cannot fight this battle without the help of school reformers – and reformers can’t sustain their efforts without us. Yet movement’s strategies are not effectively reaching marginalized communities — nor is the mindset of some reformers toward families and people of color all that helpful either. Without execution of powerful advocacy, our kids will continue to be trapped in classrooms where they are taught by teachers that don’t believe that our children can achieve greatness. It is time for reformers to effectively partner with parents and communities, to go beyond the yellow t-shirts, and affect sustainable change. This means empowering families within their own communities alongside responsive public policy. We like to say that Black lives matter, Latino lives matter, poor children’s lives matter, even English Language Learner lives matter. Yet families, especially those of children of color, have to fight so long and hard so that our children get the educational opportunities they need. This is because there are other people who don’t think their lives matter. America made a stand for equity and for all lives when it passed the No Child Left Behind Act 13 years ago. Obstruction from states and school districts limited execution of some of those provisions. But the law’s Adequate Yearly Progress provision has shined important light on how many schools, including those in suburbs in states such as Connecticut (where my kids and I live) are poorly serving our children, especially those of color. Now thanks to the Obama Administration’s No Child waivers granted to states such as Connecticut, the educational and civil rights of our children are being waved goodbye. Thanks to the Obama Administration’s No Child waiver process, states like Connecticut, which has one of the nation’s most-persistent socioeconomic achievement gaps to ignore No Child’s Supplemental Educational Services provision and gut tutoring and other afterschool programs. Certainly states and districts have done everything they can to avoid setting aside 20 percent of Title 1 dollars for those services – and haven’t fulfilled the promise of the law. But for our children, especially in poor-performing districts such as Bridgeport, those services could help them improve their reading and numeracy. Because of the No Child waivers, Connecticut now takes those SES dollars and hands them to locals of the National Education Association and American Federation of Teachers to fund so-called professional development programs. This now means that teachers in my state can take culinary classes instead of working on improving instruction in reading and math on behalf of our children. Cooking classes over reading? Where is the accountability in that? Even more shameful, the No Child waivers allow states to relegate poor and minority children into super-subgroups. In Connecticut, this takes the form of the “high needs subgroup” consisting of ELL students, low-income students, and kids in special ed. This essentially defeating No Child’s original intent of disaggregating data on how our children are performing so we can know how schools are serving them. Thanks to super-subgroup gamesmanship in Connecticut and elsewhere, districts can continue to funnel our children into the school-to-prison pipeline, harming children of color and those who are poor. What is so disheartening about the No Child waivers is that the Obama Administration could have avoided all of this damage. As Dropout Nation Editor RiShawn Biddle has chronicled over the past few years, peer review panels have determined that there were problems with nearly all the waiver proposals submitted to the federal government. Particularly in the case of Connecticut, the peer review panel concluded that the state department of education provided “limited information” on how the performance of subgroups would be tracked under the state’s new accountability system. The state’s super-subgroup subterfuge “could make it more difficult to identify specific subgroup needs” and let districts hide their inattention to our neediest students by overemphasizing the success of high-achieving kids from wealthier homes. In spite of these concerns, the Obama Administration approved Connecticut’s waiver as well as those of other states at the expense of our children. Even worse, as the state moves today to convene parents and others to get the blessing for a waiver extension, it is unlikely that it will make any changes to its waiver that will actually expand accountability, choice, or help for our children most in need. So let me be clear: Thanks to the No Child waivers, a wealthy state that home to some of the nation’s most-prestigious universities can continue to ignore one of the worst achievement gaps the country. Thanks to the waivers, the state can ignore the socioeconomically disadvantaged in its cities, the children of color in its persistently-failing schools, and the kids endangered by unsafe and poor-performing schools. Thanks to the waivers, Connecticut gets a free pass on its failure to provide high-quality education to 50,000 children, who will eventually become the adults who are underemployed and unable to qualify for meaningful work. As a Democrat and as a black woman, I have to say the Obama Administration’s waiver effort has set our state back and has set the nation back. The waiver effort is one reason why discussions in Congress are now focused on further rolling back accounting and leaving children in color and kids in poverty behind. There’s no way we can call the waivers nothing less than a violation of our promise to our children to protect their civil rights, an abrogation of educational equality, and a setback to our communities. It is hard enough in Connecticut to fight teachers’ unions and other entrenched interests uninterested in providing my children and kids like them with great education. This is why other parents and I are fighting this year to build upon the nation’s second Parent Trigger law and beat back efforts to place a moratorium on expanding charter schools. But thanks to the No Child waivers, the fight we are waging is even harder. This week, a 69-year-old great-grandmother, Lynda Faye Wilson, and I represented ourselves during oral arguments before a Connecticut state court judge to oppose an effort by the Gov. Dan Malloy to dismiss a lawsuit we filed earlier this year. And during that hearing, we confirmed why all families – especially those who are people of color who will always be judged by the color of their skin as well as the content of their character – must access high-quality data and knowledge in order to aggressively advocate for our children so they can get the high-quality education they need. One of the most-amazing aspects of American public education is that families are compelled by state laws to send their children to school regardless of quality, yet they are denied their reciprocal rights as families and citizens to shape education decision-making. This is especially true when it comes to state boards of education, which are often influenced by affiliates of the National Education Association and American Federation of Teachers, who use their campaign dollars and political pull to make sure that governors and state officials do not represent families properly. So parents and caregivers such as Lynda and I (along with another mother, Sh’Keia Dickerson) must work zealously – including in courts of law – to make sure that all families are represented. This is what we began doing in September, when we filed suit against Malloy and the state to seek the removal of Erin D. Benham, president of the AFT’s Meriden Federation of Teachers and executive board member of the AFT’s Nutmeg State affiliate, from the state board of education due to ethics violations by Malloy as well as Benham’s conflict of interest as a leader in a teachers’ union. And Malloy, who appointed Benham to the board earlier this year after the state legislature ended its session, has fought to dismiss our suit ever since. The latest step began on Monday at 9:30 a.m. with a straightforward hearing. That morning, an official from the state attorney general’s office, on behalf of the governor, began explaining to the judge why Benham, a teachers’ union leader who doesn’t represent families, should be allowed to sit on the state board like any other “Average Joe”. From where the governor sits, neither Ms. Wilson nor I offered a sensible argument against Ms. Benham’s appointment, and in fact, were wrong in alleging that our civil and constitutional rights were violated by the appointment of what the lawyer tried to call a humble educator. In our minds, our we wondered how could anyone call a teachers’ union leader with millions of dollars (as well as other political influence) at her disposal an Average Joe. But we didn’t worry. Because we had spent months talking to legal experts as well as gathering evidence. So we were well-prepared to counter-argue. After Gov. Malloy’s legal representative finished his oral argument, I stood up and presented or case. We laid out the statutory language that outlines the appointment process to Connecticut’s board of education while the legislature was in and out of session – to the shock of the assistant attorney general. It is a look I have seen on the faces of teachers, school leaders, legislators, and even my fellow school reformers before. This was the look of shock that a mother, an Average Jane like I, a black woman, could speak for herself, do so eloquently, and with the knowledge that in their minds should belong to them alone. Then I laid out the details of our lawsuit. I presented evidence that Benham’s appointment by Malloy was a clear conflict of interest because she was an AFT local president, a leader in a union that contributed $10,000 to his re-election campaign through a donation to the Connecticut Democratic State Central Committee and $250,000 to his campaign through the Connecticut Forward Super-PAC. Furthermore, we as parents allege an AFT leader cannot be an impartial member on the state board of education because of the union’s well-publicized opposition to the Connecticut’s Parent Empowerment law, the nation’s second Parent Trigger law. Over the past four year, AFT and NEA opposition has led the state to refuse to enforce the law. This has left more than 100,000 children trapped in low-performing schools. AFT Connecticut’s efforts to quash the Parent Trigger law was exposed three years ago when Dropout Nation revealed its presentation on how it took action to first “Kill”, then “Diffuse” the law at a national AFT conference. The revelation was so embarrassing to AFT’s national leadership that its president, Randi Weingarten, came to Connecticut to apologize to me and to politicians who backed its passage. After our presentation, the assistant attorney general was given a chance to provide rebuttal. But instead he proceeded to tell the judge that he was not aware that Benham was an interim appointment. Why wasn’t he aware? He said it was because “the parents” didn’t tell him. Throughout his rebuttal, he confirmed that he no longer viewed us as mere bystanders and that he could no longer downplay our presence as a mere nuisance. When parents have access to high-quality information and resources, we can challenge efforts by politicians and others to protect the few at the expense of the rest of us. When families of color and those from low-income households have access to high-quality data, they can disprove the notions of so many that communities of color and low income are unable to work aggressively on behalf of our children. Well-informed parents are powerful – and no one should underestimate them. School reformers should especially be ready to join common cause with Parent Power activists to help all of our children get the best they deserve. But it isn’t just about data alone. The fact that we parents, who were well-educated enough to navigate the world around us proves how important it is for all of our children to be provided high-quality education. When our children are highly-educated, they can go far as adults in ensuring that future generations of children can grow up safe and well-educated. When families have high-quality data, they can be champions for all children. We should work to empower every parent and caregiver.